I'm not sure if you've heard, but organic reach on Facebook is dead. Okay, maybe you have heard this but do you truly understand what this means? I read a stat recently that said if you have 10,000 pages likes on Facebook, you'll typically reach only 5-10% of these people. Yep. Only 1000 of your 10,000 fans might actually see your post. 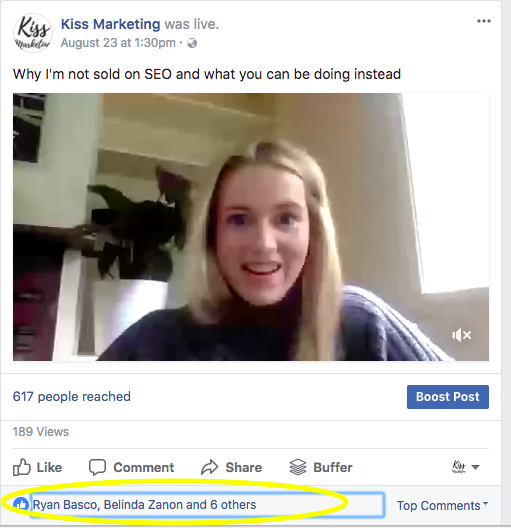 This is the number 1 reason why I discourage businesses who are just starting out to not get sucked into the trap of running a 'page likes' campaign. Essentially, you'll be paying for people to like your page and then paying AGAIN in boosted posts for them to see your content. Talk about a waste of money. It's so easy to get caught up in the vanity metrics of Facebook - impressions, likes, etc. This is what Facebook wants and is the reason why Mark Zuckerberg is worth 44 billion! Instead, head to ads manager and create an ad for engagement. Don't make this a 'salesy' piece of content, instead make it something valuable like a video, funny image or awesome blog post. Once people start responding and liking the post, you will see a button comes up next to their name that says 'invite'. By clicking this, you will be inviting them to like your page. Two birds, one stone.